This super fun dessert is a blast for both the kids and adults. 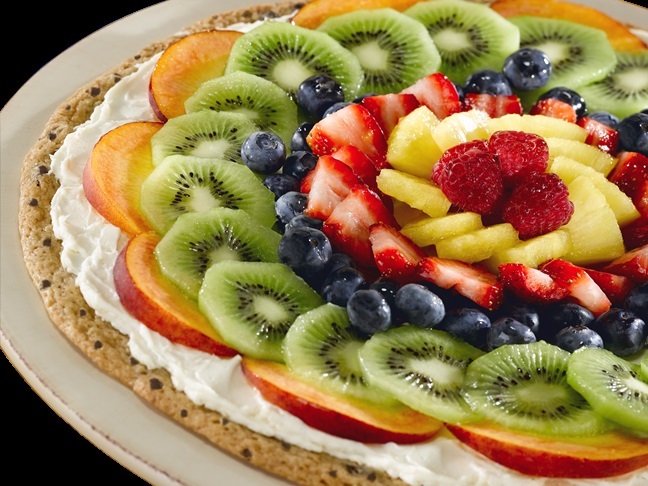 Everyone will love giving their pizza its own signature with their favorite fruits and jam flavors. Serve it up on the kids table for a great, easy appetizer, or save it as a special treat for children’s Christmas party. Check out the recipe, courtesy of Martha White, below. Martha White Blueberry Flavored Made With Whole Grains Muffin Mix , or 1 (7.4 oz.) pkg. Step 1: Heat oven to 375ºF. Cover large cookie sheet with double layer of parchment paper. Step 2: Stir together muffin mix and brown sugar in large bowl. Cut in butter with pastry blender or two knives until size of peas. Slowly stir in cream and 1 teaspoon vanilla with a fork until ingredients are moistened. Form dough into a ball with floured hands. Knead 3 to 4 times in the bowl. Flatten into a 6-inch disk. Wrap with plastic wrap. Chill for 30 minutes. Step 3: Once dough has chilled, unwrap it. Place it in center of parchment covered pan. Leaving plastic wrap on top, press with palms of hands from center to outside edge into 11 inch circle. Work quickly so dough remains cold. Pierce dough all over with fork. Chill for and additional 20 minutes. Step 4: Remove dough from fridge and slide it into the lower third of your oven. Bake for 10 to 12 minutes or until medium to dark brown. Cool completely on wire rack. Gently loosen with spatula. Place on serving tray. Step 5: Beat cream cheese, powdered sugar, 1 teaspoon vanilla and lemon juice, until blended. Spread over cooled crust. Arrange desired fruit over cream cheese. Step 6: Heat apple jelly on low heat just until warm. Brush thin layer over fruit with pastry brush. Chill at least 1 hour or until serving time.